Date palms are the first things that come to mind in Ramadan time. 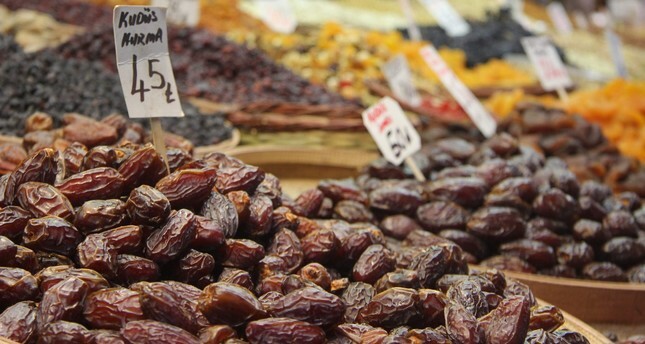 The date, which has been associated with the iftar tables, is in fact a fruit that should be consumed throughout the year and not because of its delicious taste: Dates are rich in fiber, potassium, iron, folic acid and calcium along with numerous vitamins and minerals which help physical health a lot. First of all, dates help the digestive system quite a lot thanks to the fibers in it. These fibers bloat out in the stomach when eaten and creates an illusion of fullness. These fibers also help the digestive system work faster. Dates are also rich in antioxidants which help cells rejuvenate faster and skin to renew itself. Fresher dates also give moisture to the skin to regain its elasticity and the fine lines on your face begin to fade in time. The vitamin B in dates also helps the body heal from scars faster. The heart is the most important organ in our body and date palms help it to get stronger as well. With the potassium and minerals it contains, the fruit controls blood sugar and regulates heart rhythm. Since it lacks any type of cholesterol and it is rich in antioxidants, the date helps protect the heart from harmful bacteria. According to scientific studies, the date is also rich in vitamin B6 which strengthens nerves; hence, when a date is eaten, the body creates a barrier against stress and its effects. With the vitamin B1 it contains, it also paves the way to a healthier neural system. Anemia effects a lot of people but treatment is easier than you think. The date increases the number of blood cells and hemoglobin synthesis, helping people with iron deficiency when it is consumed regularly. The season changes are the hardest on your immune system but a date’s antioxidants and vitamin C protects the body from any bacteria and prevents the risk of infections with the minerals and magnesium it contains. If you are one of those people who cannot find the energy to finish the day, just grab a couple of dates and fuel up. With the high energy it contains, a date is more beneficial than any other multivitamin that you can buy at a pharmacy. Although it has many benefits for your body, the date contains a high amount of energy, which means sugar. It can cause high blood sugar which is dangerous for people with insulin resistance and diabetes patients. Hence, it is good to keep in mind that three dates a day is more than enough for you and your body. Only docters know what good food for your health. Go see your docter for your sake of health. While the wisdom of the Qur’an is eternal the doctors seem to change their mind every decade or so. Anyway, yes, of course, we can eat more of the bounty of Allah than is spelled out in the Qur’an.